In today’s episode, you’ll hear from Joe Pulizzi, an expert in content marketing. You’ll learn how content marketing can not only generate leads but become a source of revenue in its own right. Joe is the winner of the 2014 John Caldwell Lifetime Achievement Award from the Content Council. Joe is the author of five books including his latest, “Killing Marketing.” His third book, “Epic Content Marketing,” was named one of five must-read business books of 2013 by Fortune magazine. Joe, thank you so much for joining us today. Nicole, it’s a pleasure. I appreciate you having me on the show. I’m really looking forward to your insight and bringing this new way of thinking about marketing to our listeners. Before we dive in, can you share a little bit more about your story in your own words? I find that gives so much more context to our conversation. Well, thank you. I’ll try to keep it brief. I’ve been in the content marketing industry since 2000. It’s hard to believe, almost 20 years now. I started at a publishing company called Penton Media that is now part of this big multinational media company, but I ran the content marketing services group at Penton. We did custom magazines, newsletters, and then into social media programs, blogs, webinars, podcasts ultimately. I worked there until 2007, and we worked with mostly large B2B companies like Parker Hannifin and Microsoft. That’s when I really fell in love with the practice of content marketing because I just thought it’s the purest way to communicate with an audience. I had this entrepreneurial itch and wanted to start a company which ultimately became the Content Marketing Institute. In 2011 we launched Content Marketing World, which really became the most well-known thing the Content Marketing Institute does. My friend Robert Rose and I did a podcast and some other projects as well. We ended up selling Content Marketing Institute in 2016. It was a successful exit. During 2018 I’ve actually been on sabbatical. I’m still on sabbatical actually, but I wanted to be on your podcast today. I’m writing some fiction – which I hadn’t had time for in the past – spending time with the kids, it’s been great. That’s fantastic. One of the things that I find really intriguing about your story, and why I’m so excited and glad that you accepted my invitation to be on this show, is this whole idea of your promise of how brands can build their own audiences. You said it’s the purest way to communicate with an audience. 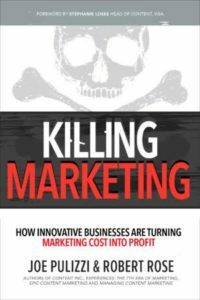 I recently read your and Robert Rose’s new book, Killing Marketing, and it struck me that a lot of the concepts that you talked about in there really do relate to our listeners’ businesses. I’d really like to explore a little bit about this. So why did you and Robert Rose decide to write that book? Thank you. It’s something that Robert and I have talked about for a long time. I’ve worked with Robert for almost a decade now. The idea of the book started as we would go into these marketing departments and everything just seemed so short-term and so short-sighted: more leads, more web traffic, more social media. Robert and I were thinking about the idea of content marketing and expanding it. A lot of people just look at content marketing as, hey, I’m going to use content to accomplish some marketing goal, to drive more leads or to create more loyal customers or whatever. That’s fine, but we thought, what if more and more companies looked at content marketing as a business model? That’s what we started to approach, and started to research a number of companies that were actually doing this. So you have an audience of people who have opted into some ongoing form of communication. That could be a podcast, a video series, an e-newsletter subscription. Once they did that, they were driving revenue in multiple ways. Once you build a loyal audience, you can drive revenue a number of different ways. You can drive revenue through advertising and sponsorship, you can sell content directly to them, you can serve premium content, e-books if you will, you can launch events, large-scale events, and you can also sell more products and more services, increase yield and create better customers – all those things. So content becomes an asset, a revenue driver. With content marketing, you’re building an asset over a long period of time and actually increase the value of the total company, because you can drive revenue in so many different ways. So for the tourism industry, you can sell sponsorship to your own e-newsletters, your own webinars, to the travel and tourism companies that are listening. You can do all those things and work with partners, so that’s the low-hanging fruit. Then you can also do things like creating large-scale events. If you look at Salesforce, Salesforce is a sales and marketing software company, but they also have a billion-dollar event called Dreamforce, that if they sold it, would probably generate more than a billion dollars. Right. I agree with that, and I think that it’s so relevant not just to those billion-dollar companies that you worked with, but also even all the way down to the smallest of businesses, they are already building these very loyal audiences. What I really thought was also interesting in your book is how you talked about the balance of where you build those audiences. I’m wondering if you can just quickly talk about that. I’d love to know more about the what and the how of building an asset. Absolutely. By the way, you made a great point about small businesses. I mean, Content Marketing Institute I started with my own money and my own credit card debt, and we were able to go from zero to over $10 million in revenue in five years, and we’re just a small company, not many resources. I mean, so it doesn’t have to be a billion-dollar company. Anyone can use this if you do build a loyal audience. The value of an email subscriber to me – somebody who opts in and says, “Yes, I would like to receive your e-newsletter, please send it to me because it’s so valuable,” is very, very valuable. That subscriber can generate a number of different types of revenue for you. A Facebook fan or a YouTube subscriber is valuable but not in the same way because YouTube and Facebook own the distribution process of making sure your communication goes to that person. Facebook controls the flow of information and they want to make sure that you pay for advertising on Facebook. They don’t want to give that access away. So in this hierarchy, the goal is to move subscribers up the chain. You want to try to get them ultimately to subscribe to an email, an app that you own, some kind of print subscription to your print newsletter or print magazine, so you can get their real data and then you can communicate with them on a regular basis. You should get up every day thinking, “Well, what do I do? What’s the next step for these people?” That’s to move them into something you have more control over, hence building an asset to the organization. Having a YouTube following is not an asset. Having an email database is an asset. Yes, and I think that’s just such an important point because as you’re talking about moving them up the subscriber hierarchy, I was actually thinking about even the decision funnel that we often talk about in travel and tourism, as people are making a decision about a destination to travel to. It’s kind of a similar process because you’re thinking about this really broad audience that you’re reaching, say with your YouTube channel or whatever it might be, where you have this large reach you might be putting a paid campaign behind, and then you’re trying to move those people down into actually booking a room, booking a trip or buying a package. It seems to me like that would actually move in the same direction, as they’re moving people into this email subscriber piece or into a print subscription, or requesting a travel guide, for example, if you’re going to a destination. Well, it’s such a great point. So you get a subscriber of some sort – a lead. Now, if we can just be patient with that because right now if somebody signed up to your e-newsletter, it’s nothing. It doesn’t mean anything. You’re lucky enough to get that. If you look at it like lead scoring, that’s a more valuable lead. Take Content Marketing Institute for example: If a lead signed up for at least 3 of the let’s say 10 or 15 content initiatives we had available, they were way more likely to go to our big event, Content Marketing World, which was our lead revenue generator. On the travel side, if you can think about it that way and say, “Okay, my first step is to stick our foot in the door, get them to sign up for the e-newsletter. Then maybe if I can get them to just get on this podcast, and I can get them to maybe check out this online app that I have, then maybe if I can get them to sign up and watch some of our videos,” then you’ve created a much more valuable person that is starting to know, like and trust you, and then you can start hitting them with the offers. It’s a long-term strategy, but it delivers great results. Yeah. I think that is just such great advice, and I think you’re right. You get that email subscriber and you get really excited, and then it’s like, “Oh, you like me, let me tell you about everything I have to offer,” and you do. If you move too fast, you can turn people off. That just happened to me recently. I signed up for some things. I just took a trip over to Sicily and I actually signed up for some English versions of things from a travel standpoint, and as soon as I did, you know what I got? I got offers to do stuff, which was fine, but at this point in the process, I was learning. I really wanted to learn about the area. I wanted to understand. If they would have sent me more things to learn and to be a part of this experience that I was going to have, I think I would have been a buyer of those services instead of what I did, was I unsubscribed to their stuff. Treat a person like a human being. Okay, what page were they on? What were they looking for? Okay, well, how can we really, really build loyalty with this person before the offer? Yeah. I think that that’s such a good example of if you do move too fast, then you get those unsubscribes. I do like how you talked about taking that lead or that prospect and qualifying them to be an audience member, and how that means so much more, to have that audience member who’s interacted with you in several different ways, versus to just be on a subscription. Well, and I totally get how it’s tough, but think about long-term customer value here. Don’t think about short-term, getting them to book a room. Think about how do I derive revenue from this person that just signed up for this e-newsletter? It’s a different approach from a short-term win. I have to have them to stay subscribed to this, so that I can deliver all these amazing content experiences to them, so I can help them with their lives in some way, and then when they’re ready to make a decision, we’re here for them to book that room, to come to our location, to do whatever, to have this different kind of experience that is a natural progression from the content experience we’ve been giving them. Yes. I think that that’s really such great advice. This whole idea of changing from a marketing department to a media company and the relationship you have with a media company. So for instance, I read the New York Times. What you’re really talking about is that same kind of approach. Am I tracking with you? You know what, that’s a great example, because what the New York Times has started to do with their business … because as we know, the business model for media companies is not what it once was. It’s much, much harder for the New York Times to sell large sponsorships and advertising programs, so what have they been able to do? They’ve been able to diversify their revenue streams a number of ways. They’re launching events, they’re selling a number of products and services online now, that you’d never think that a media company would do, but that’s what they’re doing. Their business model has evolved into both the media company and a product and service model. That’s exactly what we talk about in Killing Marketing. Let’s look at travel and tourism – getting heads in beds. Well, if you’re doing what the New York Times is doing, you’re saying, “We can generate revenue in a number of different ways.” Maybe then you can do what the New York Times has done where you can launch your own events. You can launch your own sponsorship and advertising, you can sell your own content pieces. Just think out of the box. It’s tough for us to make that leap right now, but this is exactly what’s happening because the business model for a media company and the business model for a product and service company is becoming exactly the same, we just haven’t noticed. A travel and tourism brand is already competing with the media brands in your area. Well, just become what you’re supposed to become. Become that media company and become that travel and tourism company that you know you can be. You just have to think about it differently. It is definitely already happening. It really is trying to look at something with a different lens that’s already happening. This conversation is exactly what I had hoped it would be. In travel and tourism, the longer people stay in a community, the more money they spend, the more economic activity that happens within the community and the better it is. If you’re so focused on just getting them in, the heads in beds, it’s very difficult to think outside of the box. That’s really what I wanted to explore. There are so many choices of places that we can go all over the world. So this whole idea of not only building this audience and trying to move them down that funnel, but then to be able to come up with like another way to earn revenue for your organization, is really what I think is something I’d like to explore a little bit more with you. What are some different ways a company can drive revenue with their content? Yes, absolutely. There are two different ways to drive new revenue once you build a loyal audience, so that’s the key. Build that audience, and give true value to your audience on a regular, consistent basis. You can build that audience that starts to anticipate the kind of content you’re going to deliver to them. Then there are direct and indirect ways to generate revenue, so let’s look at direct first. All the direct revenue that you would drive, that’s exactly the traditional ways a media company would drive revenue. First is advertising and sponsorship. Maybe I’m doing fun, educational webinars I could have sponsored. If you have a podcast, that could be sponsored. All the content initiatives you have, that could be sponsored by a non-competitive partner, especially for destination companies, economic development companies. There are so many partners that want to see you succeed because it leads to their success. They’re willing to support your initiatives and do that, so that’s where you go and you pull in your partners, so that’s the one. Sponsorship, advertising, lowest-hanging fruit. Then you go on to events, a natural for the travel and tourism industry. Look at South by Southwest as a great example – driving a number of different types of revenue to the City of Austin over the past 30 years. Any company, any organization, any location, can do that. Most of these events that are launched, if they’re done right, they’re very profitable, that you can then take and generate into other forms of marketing for yourself. Then you have value-added pieces of content maybe on the B2B side of the house to help some of your members, maybe white papers or e-books or something that people will pay for. Then you have your indirect revenue, which are some of the things we’re already familiar with. If you think about products, and you’re a hotel and you’re trying to drive people to reserve a room, whatever your direct products are that you’re trying to launch. Then you have different services, like consulting services. For instance, the shoe company Zappos launched a whole consulting company because a lot of organizations want to get better at culture. They didn’t know where to go. Well, Tony Hsieh, the CEO, the founder of the company, launched this consulting service. Another indirect method: how do you create a more profitable customer base? If you think about, okay, well, what if I launched a magazine? They subscribe to the magazine and develop into a longer-term customer. Instead of, let’s say, coming to your location one time a year, what if they read the magazine and they end up coming two times or three times a year? Those are the types of things that we see. John Deere launched a magazine, The Furrow, back in 1897. Why did John Deere launch that magazine, the largest media brand in the whole farming and agriculture industry? Because they found out people that read that magazine end up buying another John Deere. Of course, you can go through the book and look at all ten different ways and lots of different examples, but I think that that’s where, if you’re thinking about your marketing model, sure, you have your goals. That’s fabulous. Well, Joe, I knew this would be an awesome conversation, and I know our time is starting to come to a close. I really do appreciate you coming out of sabbatical to speak with us today. Thank you, Nicole. This has been great.